Here in the States it's almost Labor Day weekend, the unofficial end to summer. Next Tuesday will bring the beginning of school for nearly every elementary and secondary student in America. Many young children will be asked to write about "what I did on my summer vacation". It seems like a good assignment for Crabby as well. We started with a lot of talk about what salads to bring to your picnic, but quickly transitioned into grilling. Surprisingly to me, there really wasn't too much beef or chicken on the menu. We spent a great deal of time with pork and fish, as well as becoming enamored with Soba noodles. Heat always means keeping this light. As we approach the fall and winter the paradigm shifts. The ebbing of light means we'll be generating more of our own heat. Fall and winter mean soups, stews, risottos and roasts. Crablings, you've had it kind of easy so far. Pretty soon we're going to have to start really cooking. In fact, before the the end of October we will have tackled the greatest beast in all cooking...gravy. But not now, it's too hot. I still have a few easy grill recipes left in me. Today it's back to fish. Some of you complain about too many seafood recipes, but the funny thing is they're the ones that generate the most hits. So it's either do as you say or do as you visit, today we're doing as you visit. 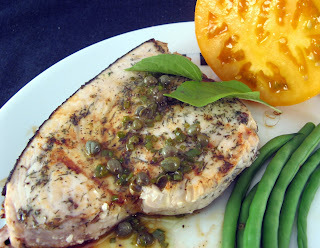 This swordfish recipe epitomizes summer cooking: quick rub, quick grill and a quick dressing. 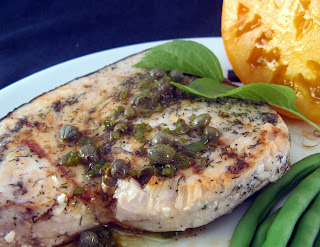 The tang of the grilled lemon-caper dressing is a great counterpoint to the richness of the swordfish. Even those crablings out there who are sick of fish will enjoy this light meal. Preheat your grill over medium-high heat. Cut each lemon in half and lightly brush cut sides with olive oil. Grill the lemons, flesh side down over direct heat until nicely browned, approximately 5 minutes. Remove from grill and allow to cool. Using a small bowl, juice the lemons through a fine sieve. Discard the seeds and rinds. Add the capers, then whisk in 3 tablespoons of olive oil to form the dressing. Whisk in the remaining dressing ingredients and adjust the seasoning. About thirty minutes before cooking, lightly oil the swordfish fillets and season both sides with the rub. Set aside. Make a tray out of folded aluminum foil. Place the fish on the tray and roast for 6 to 8 minutes, turning once. Remove from the grill and allow to rest (covered) for 5 minutes. Whisk the dressing one last time. Serve the fish warm, with the dressing poured on top. That's it! Give it a try, because before you know it, it'll be too cold to grill; until next time, remember, you can do it, you can cook. When matching wine and food always look for the acid/fat contrast. Fat with no acid makes your mouth feel gooey. Acid with no fat makes your mouth cringe with a bite. This dish has good fattiness from the swordfish and good acidity from the lemon juice, sooooo, drink your favorite white wine with this dish. I prefer a lower acid wine since the lemon has a tendency to dominate the mouthfeel. There are some interesting dry whites from Sicily that are priced from $10 and up a bottle. Mandrarossa Fiano should be available throughout the States. And I am still trying to get my google/blogger username attached to these, but no luck so far. I keep getting incorrect password, but I know it is correct. This is superb - i just love easy grill recipes & the least done to fish gives the best results. Long may the sun shine!! I love your fish recipes Crabby! Our barbeque season is nearly here! There's an award waiting for you on my blog. I absolutely love the caper/lemon sauce on fish. I paired it with calamari in one of my blog posts... delicious! I've had swordfish on my mind lately... and we have grilled swordfish tacos on the menu for Labor Day!